General Motors Co. (NYSE: GM) is a global company committed to delivering safer, better and more sustainable ways for people to get around. General Motors, its subsidiaries and its joint venture entities sell vehicles under the Chevrolet,Buick,GMC,Cadillac, Holden,Baojun, Wuling and Jiefang brands. More information on the company and its subsidiaries, including OnStar, a global leader in vehicle safety and security services, and Maven, its personal mobility brand, can be found at http://www.gm.com.Forward-Looking Statements This press release and related comments by management may include “forward-looking statements” within the meaning of the Private Securities Litigation Reform Act of 1995. We caution readers not to place undue reliance on forward-looking statements. Statements including words such as “anticipate,” “appears,” “approximately,” “believe,” “continue,” “could,” “designed,” “effect,” “estimate,” “evaluate,” “expect,” “forecast,” “goal,” “initiative,” “intend,” “may,” “objective,” “outlook,” “plan,” “potential,” “priorities,” “project,” “pursue,” “seek,” “should,” “target,” “when,” “will,” “would,” or the negative of any of those words or similar expressions to identify forward-looking statements represent our current judgment about possible future events. In making these statements we rely upon assumptions and analysis based on our experience and perception of historical trends, current conditions and expected future developments, as well as other factors we consider appropriate under the circumstances. These statements are not guarantees of future performance; they involve risks and uncertainties and actual events or results may differ materially from these statements. Potential risks and uncertainties that could cause actual results to differ from expected results include, among others, the “risk factors” found in our Annual Report on Form 10-K for the year-ended December 31, 2017 and our subsequent filings with the U.S. Securities and Exchange Commission. We undertake no obligation to update publicly or otherwise revise any forward-looking statements, whether as a result of new information, future events or other factors that affect the subject of these statements, except where we are expressly required to do so by law. For the year, TMNA reported sales of 2,426,672 vehicles, a 0.3 percent decrease on a volume basis and down 0.6 percent on a DSR basis. Toyota division posted December sales of 185,386 units, down 1.1 percent on a volume and DSR basis. For the year, Toyota division reported sales of 2,128,362 vehicles, flat on a volume basis and down 0.4 percent on a DSR basis. Lexus posted December sales of 35,524 vehicles, up 0.2 percent on a volume and a DSR basis. For the year, Lexus sales of 298,310 vehicles were down 2.2 percent on a volume basis and down 2.6 percent on a DSR basis. Nissan Division total sales grew 7 percent in the month of December. Rogue sales set an all-time monthly record with 42,523 units, up 6 percent. The Nissan Kicks crossover also saw its best month of sales since launch at 5,704 units. Sales of the Nissan Frontier pickup grew 27 percent in December to 7,492 units. For the third consecutive year, the Rogue crossover was Nissan's top-selling model with 412,110 sales, an increase of 2 percent. It was the best-ever calendar year for Rogue sales. In 2018, Nissan trucks, SUVs and crossovers set an all-time record with 784,807 total sales, a 3 percent increase over the prior year. Sales of the all-electric Nissan LEAF grew 31 percent over the prior year. Other key models showed strong gains during the full calendar year 2018: Frontier (up 7 percent) and Murano (up 9 percent). IRVINE, Calif. (Jan. 3, 2019) – Mazda North American Operations (MNAO) today reported total December sales of 25,870 vehicles, a decrease of 3.8 percent compared to December 2017. With 26 selling days in December 2018, compared to 26 the year prior, the company posted a decrease of 3.8 percent on a Daily Selling Rate (DSR) basis.Sales for 2018 totaled 300,325 vehicles an increase of 3.7 percent compared to 2017. There were 307 selling days in 2018, versus 306 in 2017, resulting in a full-year DSR increase of 3.4 percent. While Mazda’s CX-line, including the CX-3, CX-5 and CX-9, saw December sales decline by 6.5 percent to 18,955 vehicles, total sales of the three crossover vehicles finished the year up 15.3 percent, with 195,778 vehicles sold in 2018. Sales of the Mazda6 totaled 2,357 in December, an increase of 32.7 percent compared to 2017. Mazda6 sales for 2018 reached 30,938 vehicles, a decrease of 7.4 percent compared to 2017. The Mazda MX-5 Miata finished December up 3.7 percent, with 511 vehicles sold, while full-year sales of the two-seat roadster totaled 8,971, a decrease of 20.6 percent compared to 2017. Mazda Motor de Mexico (MMdM) reported December sales of 6,055 vehicles, an increase of 8 percent compared to December last year. MMdM saw record-setting sales in 2018 totaling 58,105 vehicles, an increase of 7 percent compared to last year. Mazda North American Operations is headquartered in Irvine, California, and oversees the sales, marketing, parts and customer service support of Mazda vehicles in the United States and Mexico through nearly 700 dealers. Operations in Mexico are managed by Mazda Motor de Mexico in Mexico City. For more information on Mazda vehicles, including photography and B-roll, please visit the online Mazda media center at InsideMazda.MazdaUSA.com/Newsroom. Follow MNAO’s social media channels through Twitter and Instagram at @MazdaUSA and Facebook at Facebook.com/MazdaUSA. Sales HighlightsHonda finished 2018 on a strong note with both cars and trucks gaining in December, overcoming over four months of lost production due to a flood that shut the Celaya, Mexico auto plant to narrowly miss a new annual sales mark. Sales HighlightsAcura was one of the few luxury brands to increase sales (+2.8%) in 2018, setting records for RDX and light trucks, leading to new market share and the brand’s first annual gain since 2014. Echoing customers' industry-wide preference for crossover utility vehicles (CUVs), MMNA's broad CUV lineup lead the way for the brand in 2018. Outlander Sport finished the year up 18.1 percent over 2017, leading the company's sales, and recorded its best sales year ever. The three-row Outlander also posted its best sales year ever with total sales up 6.6 percent over 2017. New to the lineup in 2018, the Eclipse Cross and Outlander plug-in hybrid electric (PHEV) both posted their best sales month ever in December. Eclipse Cross December sales were 1,597, while the Outlander PHEV posted sales of 431. Combined, MMNA's CUVs posted total calendar year sales of 90,456, up 31.9 percent over 2017. While Mitsubishi's SUV and CUV lineup lead the brand's sales increases, the fuel-efficient and affordable Mirage and Mirage G4 bucked the industry trend away from passenger cars. For the calendar year, Mirage sales were up 8.6 percent. Together, Mirage and Mirage G4 posted December sales of 1,748, up 70.9 percent over 2017. The Mirage is the most fuel efficient, gas-powered, non-hybrid vehicle in America, offering an outstanding 36/43 mpg city/highway rating. percent.In December, deliveries of INFINITI's crossover and sport utility vehicles increased 41 percent for their best month ever, and for the year, rose five percent to above the 100,000 mark for the first time and an all-time record. With deliveries of 19,207 in 2018, the QX80 had the best year in the full-size SUV's history.The QX60 7-passenger crossover increased 72 percent for the month and 17 percent over prior year for a monthly and yearly record. The all-new QX50 crossover also increased in December and for the year. ATLANTA, Jan. 3, 2019 /PRNewswire/ -- Porsche Cars North America, Inc. (PCNA), importer and distributor of the Porsche 911, 718 Boxster and Cayman, Panamera, Cayenne, and Macan model lines, today announced December retail sales of 4,086. With that, 2018 sales reached a U.S. record of 57,202, an increase of 3.2 percent from the previous record in 2017. It was the ninth consecutive year of growth for PCNA and the seventh record year in a row. The Macan led the pack with more than 23,500 deliveries in 2018, up 9.7 percent. In its second year as a new generation model, the Panamera also scored double-digit percentage growth with sales of 8,042. The iconic Porsche 911 roared ahead 7.6 percent to 9,647 sales, helped by strong demand for GT models. For December alone, the new Cayenne was the best-selling vehicle in the month as the Cayenne S and Turbo variants joined the lineup for the first time. "Porsche and our 190 independent U.S. dealer partners are grateful for the excitement our cars are generating among customers," said Klaus Zellmer, President and CEO of PCNA. "A record 2018 is an excellent starting point for an even more dynamic 2019, when highlights will include the market entry of the next-generation 911, the updated Macan, and the launch of our first all-electric sports car, the Taycan, late in the year. "Porsche Approved Certified Pre-Owned (CPO) sales in the U.S. totaled 2,278 vehicles in December, up 5.9 percent year-over-year. 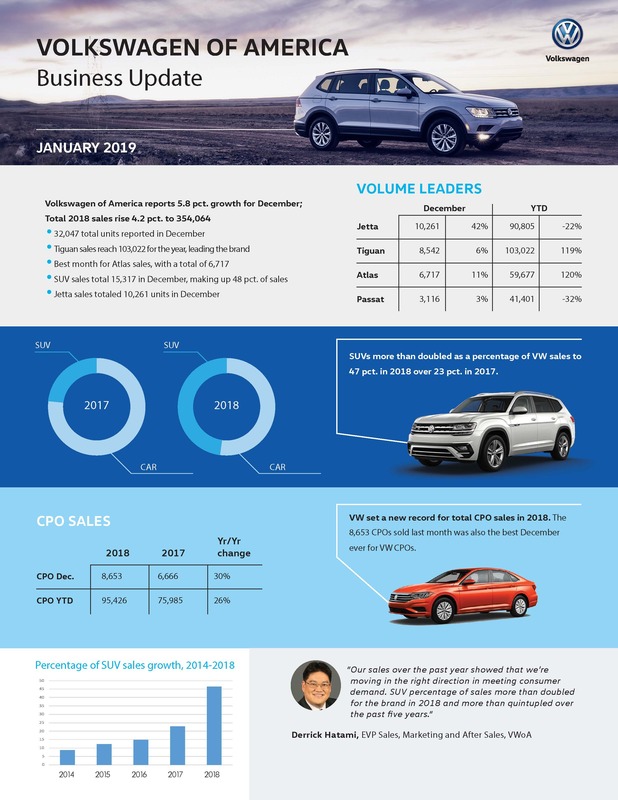 For 2018, CPO sales were up 20.7 percent with 23,046 deliveries. Woodcliff Lake, NJ – January 3, 2019… Sales of BMW brand vehicles increased 0.3 percent in December 2018 for a total of 34,357 compared to 34,253 vehicles sold in December 2017. For the full year, BMW brand sales increased 1.7 percent on total sales of 311,014 compared to the 305,685 sold in 2017. BMW of North America, LLC has been present in the United States since 1975. Rolls-Royce Motor Cars NA, LLC began distributing vehicles in 2003. The BMW Group in the United States has grown to include marketing, sales, and financial service organizations for the BMW brand of motor vehicles, including motorcycles, the MINI brand, and Rolls-Royce Motor Cars; Designworks, a strategic design consultancy based in California; technology offices in Silicon Valley and Chicago, and various other operations throughout the country. BMW Manufacturing Co., LLC in South Carolina is the BMW Group global center of competence for BMW X models and manufactures the X3, X4, X5, X6 and X7 Sports Activity Vehicles. The BMW Group sales organization is represented in the U.S. through networks of 346 BMW passenger car and BMW Sports Activity Vehicle centers, 153 BMW motorcycle retailers, 126 MINI passenger car dealers, and 37 Rolls-Royce Motor Car dealers. BMW (US) Holding Corp., the BMW Group’s sales headquarters for North America, is located in Woodcliff Lake, New Jersey. 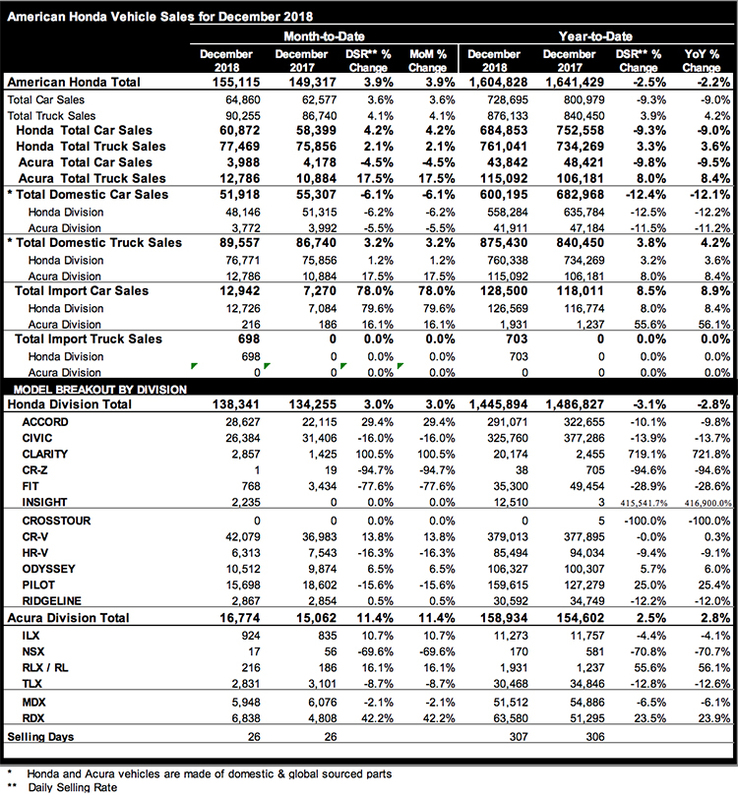 2018 Year End Sales SummaryFor the full year, Hyundai and Genesis sold 677,946 vehicles, a 1 percent decline in comparison with 2017, while retail volume was up slightly on the year. Hyundai-branded vehicle sales exceeded last year’s total, while Hyundai SUVs set an all-time annual record with more than 300,000 units sold, a 24 percent increase compared with 2017. SUV sales represented 45 percent of total sales, the highest SUV mix in Hyundai history. The Tucson led the way with 142,000 units sold, a 24 percent increase over 2017, making it Hyundai’s second highest volume model behind Elantra. On the car front, Elantra yearly sales were up 1 percent with more than 200,000 units sold and Ioniq was up 35 percent on the year. First 2019 NEXO Sale: Hyundai delivered its first NEXO fuel cell SUV to a former scientist eager to add the benefits of this zero-emissions vehicle to his environmentally-friendly lifestyle at Keyes Hyundai in Van Nuys, California.